While many things are fine in moderation, it helps to eat sweets and other sugary foods with meals or shortly after mealtime. What did Dr. Rob just say? Yes, your dentist has a sweet tooth. And a food tooth. And I’m happy!… LOL. So, why do you want to eat your favorite Christmas treats with meals? Saliva production increases during meals and helps cancel out acids produced by bacteria in your mouth and helps rinse away food particles. When it comes to picking healthy snacks, many people put dried fruit at the top of the list. But many dried fruits are sticky and sticky foods tend to stay on the teeth longer than other types of food. If you find yourself eating a lot of dried fruits such as cranberries, make sure to rinse with water and brush carefully. Those sticky foods can hide in between your teeth, especially if you don’t floss very well. ‘Tis the season for egg nog, and all the other special combinations that go with it! If you choose to imbibe, try to drink water alongside your drinks. And remember: Too much alcohol can dry out your mouth, and harm other body organs. Remember not to drink and drive. Some candies are more problematic than others. Hard candies can put your teeth at risk because in addition to being full of sugar, they’ve also been known to cause broken or chipped teeth. Be careful not to break or chip your teeth when eating nuts as well. We tend to do more crowns on teeth due to fracture this time of year. Treats such as peanut brittle, hard candy, and grandma’s home-made candy are nothing but job security for dentists. If you choose to indulge in chips and cakes, take extra care when you floss that day to remove all the food particles that can lead to plaque build-up. But if you’re normal like me, I hope you enjoy the chocolate gifts as much as I do…just brush and floss thoroughly at least twice a day. My wife and I pray the Lord’s blessings on all of you, your families, and our service men and women at this time of year. We all wish we could take away the stresses in our lives, but unfortunately, we can’t do that. Stress is what makes us stronger, refined, helps us grow in this life…right? It also wears out your teeth faster when it causes grinding habits, or as we call it in dentistry, bruxism. Whenever one of my patients comes into my office with signs and symptoms of grinding, I always ask if they wake up in the morning and see little singe marks on their pillows from sparks flying out of their mouths from grinding. That joke always gets them to relax a bit. But bruxism or grinding of your teeth either at night or during the day, is a serious problem. 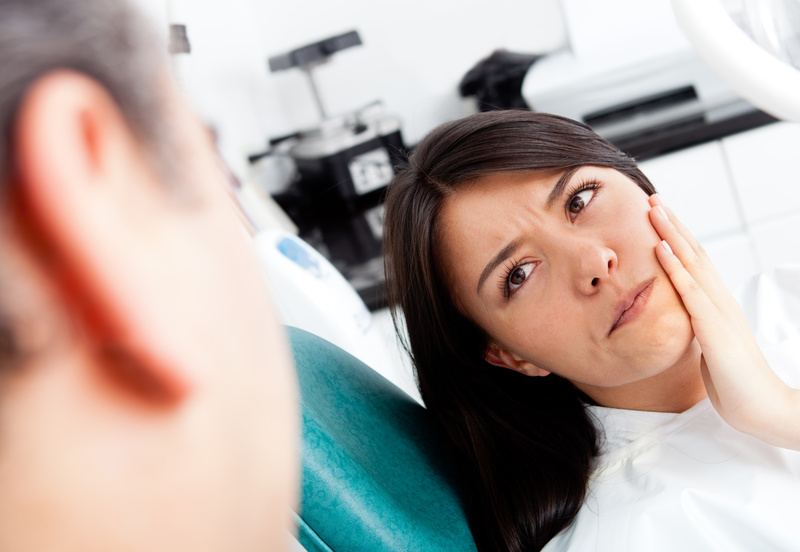 It can cause morning headaches, sensitive teeth, and even fractures in teeth resulting in root canal therapy or even extraction in the worst of cases. Treatment is usually very simple. Impressions are taken, replicas of your teeth are made, and a hard-acrylic appliance is produced and fitted to your lower teeth which protects them. That appliance is called an occlusal guard, and it’s worn at night in most cases. It’s that simple! If you even think you are grinding your teeth, especially at night, make an appointment so we can help preserve your teeth for years to come. So grateful for those men and women who have served our country, and who have given the ultimate sacrifice so that we might enjoy the freedoms we should each hold dear. Grateful to my two sons who have also served their country. We truly are a blessed nation. As my wife and I went to the cemetery to clean up the headstones of loved one who have passed, we both could not help to walk among the headstones and read the names of those who have served before. I hope you enjoy the message I came across on one of my news feeds, about the story of Memorial Day. Enjoy the weekend, honor those who have served, family who have passed, and please thank those in uniform every chance you get. “This Monday, America will be shut down for a very good reason: to honor the men and women of the past and present who have given the ultimate sacrifice while serving in our armed forces. Arlington National Cemetery, the largest military cemetery in the U.S., tweeted the story of Memorial Day and how it evolved from a post-Civil War celebration to the major national holiday that America celebrates today. The national observance of Memorial Day began when Maj. Gen. John A. Logan, then leader of the Grand Army of the Republic, a fraternal organization for Union veterans, designated May 30, 1868 for the celebration of Decoration Day. But the celebration quickly evolved from just a day honoring fallen Civil War veterans to a day honoring every American who gave the ultimate sacrifice for their country. With the meaning change came a name change. According to Arlington, people began referring to the holiday as “Memorial Day” by the late 19th Century. In 1968, then-President Lyndon B. Johnson signed into law the Uniform Monday Holiday Act, which established the national observance of Memorial Day on the last Monday each May. As all of you should know by now, I love dentistry. I love taking care of all my patients, and working with some of the best dental team members both past and present. I believe it is an honor to be entrusted with the oral health care of the public, and all of us at Thorup Dental constantly strive to deliver the best care possible to those we serve. I hope to be able to continue the practice of dentistry for another fifteen to twenty years from now. Why? Because it’s amazing to be able to help people get out of pain, enhance their smile, and just improve their overall health. Working Until 70 Beneficial, Research Suggests. 1-The wisdom that older workers can impart is often times priceless. 2-On-the-job experience can not be learned in a classroom. 3-Our brains stay sharp when mentally and physically challenged. Happy Mother’s Day to all you wonderful moms! Sometimes my patients wonder why I rarely prescribe opioid type pain medications for their dental pain. It’s simple, opioid pain medications do not block pain receptors as well as over-the-counter pain medications. Hopefully this article I am sharing with all of you will help you better understand how to control pain associated with dental conditions. One of the reasons I love dentistry is the constant increase in technology to provide dental care to my patients. Same-day restorations are one of those technologies. CAD/CAM dentistry, or computer-aided design and computer-aided manufacturing, is where I can prepare your tooth for a crown, scan the prepared tooth with a special device, and computer generate and mill the restoration in minutes. Some of the benefits of CAD/CAM restorations are: more precise fit than laboratory generated crown, seals out microbes better than traditional lab generated crowns, milled restorations are completed at chair-side, the milled materials are strong as natural teeth and natural looking, and the procedure is done the same day. Those are just a few of the benefits of these hi-tech restorations. CAD/CAM restorations are definitely not figured into insurance fees, and will be an upgraded restoration. However, most patients choose these restorations due to the convenience of having the crown or inlay/onlay restoration cemented on the same day. Receiving a CAD/CAM Restoration usually only requires an additional 45 minutes added to the crown appointment. CAD/CAM technology is just another way we choose to serve our patients with the best dentistry has to offer.